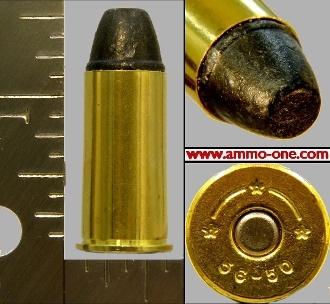 Our Products >> .56-50 Spencer, Center-Fire, One Cartrigde, not a box! One Cartridge not a Box! : 56-50 Spencer, CENTER-FIRE, new “LIVE” production using new Starline brass cases with “*ˆ*ˆ*56-50" Head-Stamp cases and loaded with a 340 grain lead projectile. The 56-50 Spencer started out as a rim-fire cartridge for the Spencer rifle, which was first issued in late 1862, and carried by the Union Cavalry before the 1860 Spencer carbine was issued. Custer's Michigan Troops at Gettysburg were carrying this Spencer Rifle. As 56-50 Spencer rim-fire ammunition is long obsolete and pricey, some rifle owners have converted their rifles to center-fire. A few companies offer a reproduction Spencer rifle in center-fire. .56-50 Spencer, Center-Fire, One Cartrigde, not a box!